Tuesday’s declines had an impact on the harmonic picture, but not exactly how I expected. The large bullish Gartley that has been forming since 4/18 was completed at the lows (* on the chart). The smaller 5/17 – 5/22 bullish Gartley targeting 1352 failed due to the extension of the CD leg; but, thanks to Wednesday morning’s action, became a Butterfly pattern with a near-term target of 1355. Meanwhile, the 4/18 Gartley becomes a Crab — now targeting 1358 at the .618 retrace. I have no clue as to the correct EW count and, judging from the debates going on, only half the people do. The other half are dead wrong. Whether we bounce from here or not is anyone’s guess. But, if the decline stalls, look for a big rebound to at least the .618 XA retrace to 1358 on the larger Bat pattern, egged on by the smaller Butterfly pattern — with targets ranging from 1328 at its .618 retrace to 1358 at its 1.618 extension. There’s plenty of overhead resistance all the way up — starting with 1332, the .50 fib and top of the channel that’s taken us down to these levels. But, now we have a quantifiable motive for a sizable rebound, whether it’s the start of Minor 5, a 3rd of a 3rd, or whatever. 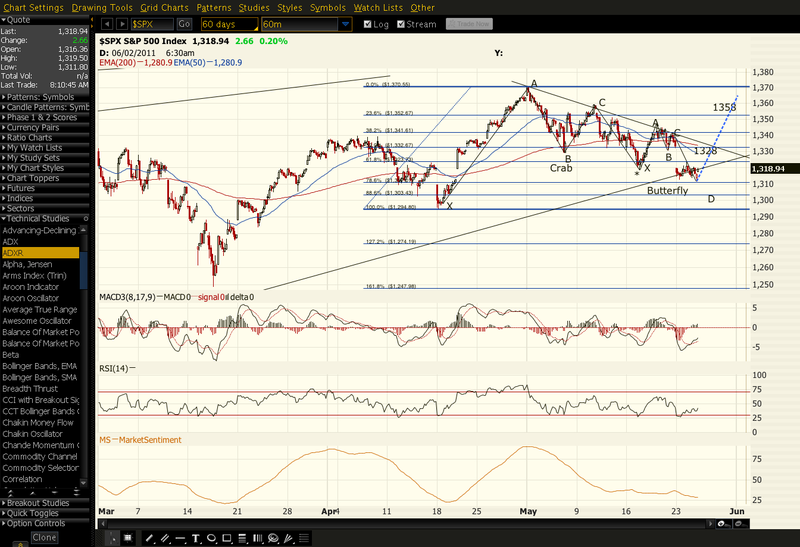 Backing up a bit, we can see the market trying to establish a higher low from the 4/18 low of 1318. If we go up from here, as I expect, the decline from 1370 will prove to be corrective — some form of wave 4 that drives us to a higher high. 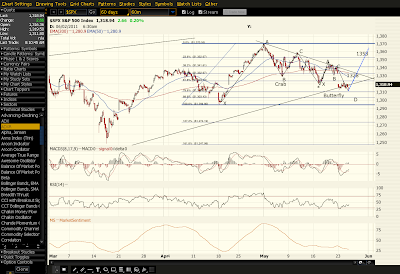 Market Sentiment on the chart below would support that view. If prices hold up, we should also see a bullish engulfing candle on the day, adding fuel to the short-term bullish case made by harmonics. The large bearish pattern set up off the Mar ’09 lows is unchanged, still indicating 1381.50 near term and much, much lower long term. Thanks, djindu. I'll try to be worthy! Thanks, Kliguy, appreciate the props. You've got a nice blog, yourself. I'll take you up on the suggestion.